Sell domain names with GetDotted's free Sell Domains service! We've got thousands of quality pre-owned domain names available at prices to suit any budget. Got some domain names that you think can earn you a fortune? With GetDotted.com's free 'sell your domain names' service (promotion of domain sale only), you can list unlimited domains for sale with hosting included. And all of this is free of charge. Unlike domain auctions where you have to accept the highest bid for your domain names, our simple listing service lets YOU choose how much to sell your domain for. We don't even take a fee if you sell your domain names either, unlike some big domain name auctioneers do. Find out more below. domain for sale, for free! Looking for a step-by-step guide to putting your domain names up for sale? portfolio to put up for sale. might be worth a fortune. Why not check out the 1,529 domains for sale at GetDotted.com? If you already have a domain name with with GetDotted.com, or if you already have a MyFreeola account, you can log in here and list your domain name for sale. You can buy cheap domain names from GetDotted.com, or if you already have domain names hosted elsewhere, you can transfer them to GetDotted.com free of charge and take advantage of our free 'Sell your Domain' listing. WHAT IF MY DOMAINS ARE HOSTED WITH ANOTHER PROVIDER? 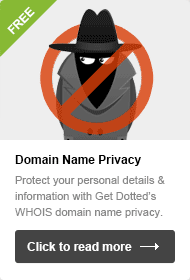 Don't worry, while your domain names do have to be hosted with GetDotted.com before you can sell domain names through us, you can transfer them into GetDotted.com absolutely free of charge. Once your domains are successfully transferred into us, you can choose to put your domain names up for sale and specify prices within the MyFreeola Control Panel. WHAT IF I DON'T HAVE ANY DOMAIN NAMES TO SELL? If you don't currently have any domain names, but want to start investing in domain names, you can register new domains you think might increase in value using our domain search. Domains are becoming increasingly valuable, as more of the sought after domain names become registered. For example, viewit.com recently sold for $40,000! You can register domain names from as little as £4.26 per year through GetDotted.com, and put them up for sale (for any amount) absolutely free of charge. HOW DO I MANAGE THE DOMAINS I HAVE UP FOR SALE? Easily, by using your MyFreeola account. Every GetDotted customer receives a free MyFreeola Control Panel to manage and setup every aspect of their domain names, including putting domain names up for sale. You'll be able to choose which domains to put up for sale, adjust prices and decide whether you'd like a holding page, or your own website at your domain. CAN I SELL MY DOMAIN NAME BUT KEEP MY WEBSITE ONLINE TOO? Absolutely. The great thing about GetDotted's domains for sale service is that you get to choose how everything works. As well as specifying a price to sell for (or welcoming offers), you also get a choice between keeping your current website up and running (if you have one) or having a free 'holding page' which will neatly present that your domain is for sale to any visitors. ONCE MY DOMAIN IS UP FOR SALE, AM I UNDER ANY OBLIGATION TO SELL? Not at all. You can remove your domain name from our for sale listings at any time, without giving any notice at all. This can be done from within your MyFreeola account. HOW ARE NEGOTIATIONS AND PAYMENTS HANDLED? When you list your domain name for sale, you will be asked to provide an email address which will be used to automatically forward any enquiries from prospective buyers onto you (via a web form). Don't worry, we will NOT publish your email address. It is up to you how you deal with further negotiations and sales. GetDotted does not provide the facility to handle bids, invoices or payments etc. for your domain sale listing. Instead, we recommend using an Escrow service, such as https://www.escrow.com/domains. HOW MUCH COMMISSION DO GETDOTTED TAKE OR HOW DO YOU BENEFIT? Whether your domain name sells or not, we don't take any commission or fee. We won't charge you a penny for listing, delisting or selling your domain. HOW WILL PEOPLE KNOW THAT MY DOMAIN NAME IS UP FOR SALE? Any domains that you list for sale will be displayed on our 'Pre-Owned Domains' pages, which are shown to a wide audience 24/7. Our pages are regularly visited by people who are looking for the best domain names. All you need to do is specify the domain sale settings, and let us do the rest. Take a look at our catalogue of current domains for sale to get a better idea. HOW WILL I KNOW WHEN SOMEBODY IS INTERESTED IN BUYING MY DOMAIN? When you put your domain up for sale, you'll be able to specify a contact email address for yourself. 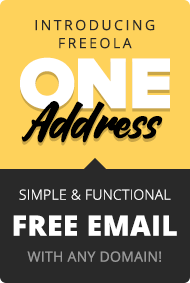 If anybody is interested in buying or enquiring about your domain name, they'll be prompted to fill in a simple contact form with their details, which will then be passed straight on to you via email. 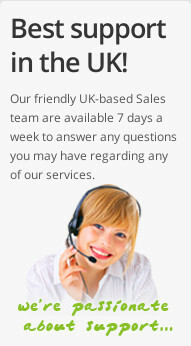 Your email address will not be publicly visible, and we'll even vet any enquiries to make sure they're not spam. Sell Your Domain in 5 Easy Steps! 1. Buy or Transfer existing domain to GetDotted.com. 2. Log in to your MyFreeola Control Panel. 3. Click 'Sell My Domain Names' on the left-hand side. 4. Select which domain(s) you wish to sell. 5. Fill out the easy For Sale details on the following page!